Liquid Cleaning Packets are water-soluble and contain portioned liquid cleaning concentrates. PAK-ITS are biodegradable, phosphate free, EarthWise-certified and DfE (U.S Environmental Protection Agency Design for the Environment) certified formulations. 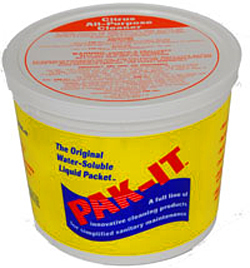 Cleaning personnel place a PAK-IT into a spray bottle, mop bucket, floor or carpet machine and the pouch dissolves in sixty seconds. The packages are pre-measured and color-coded.